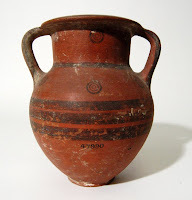 The Cypriot Black on Red ware, also known as Cypro-Phoenician ware, are characterized by a well burnished red slip and thin black stripes decorations. 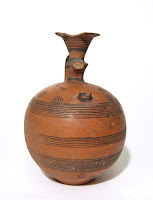 The most common vessel type of this ware is the juglet, used mainly for cosmetics. 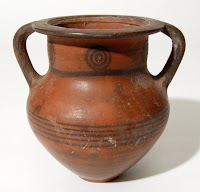 However there are also other types of vessels in this ceramic family. - Schreiber, N. 2003. 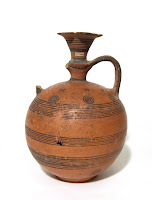 The Cypro-Phoenician Pottery of the Iron Age. Leiden.